Central location with best facilities. 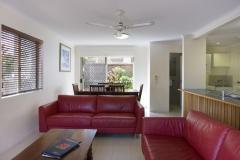 Across from Noosa River and 5 minutes walk to shops and restaurants. Fully self contained and air conditioned villas set in tropical gardens. The resort boasts three pools including a heated pool (30 degrees) and a large lagoon pool with waterfalls, an island and bridge and includes a shallow wading area. There are two full size tennis courts, two saunas, three spas, gym and games room.